Founded in 1968 on highly eroded land north of Pondicherry, Auroville is based on Aurobindo’s spiritual philosophy of human unity. Today it has become a lush green township with small urban hamlets scattered across—and a propagator of sustainable living at the community level. Over the years, Auroville has become the “it” place for lifestyle experimentation. 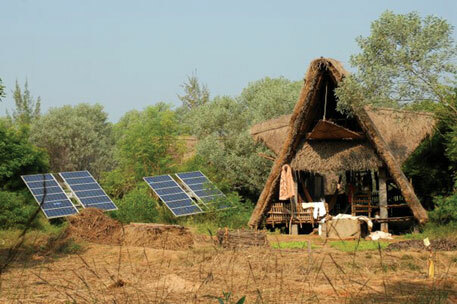 By using local resources innovatively in all spheres of living, Auroville has become successful in its mandate of bridging the past and the future. “Real sustainability cannot be achieved by fixing one component; built environment has to be complimented by lifestyle practices. It is a sort of Lego connection,” says Manu Gopalan, principal architect at EartHauz, an architecture firm in Auroville. The eco-suave nature of the township inherently pushes for energy-benign lifestyle and buildings, he adds. But what really makes the township green is its 3,000 residents. 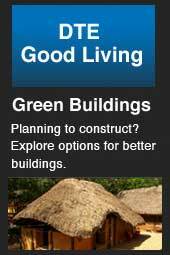 Auroville puts emphasis on quick-to-build techniques and technology. The original capsule design by Fertile was simple modular assembly of casurina wood, bamboo and keeth roof held in place by ropes and nut bolts. “It used to take a team of three to four men two days to make a capsule in the starting days and the expenditure was Rs 5,000,” recalls Fertile. “But now it takes more men and more days and costs about Rs 20,000,” he says. “I can understand the rise in money, but why more days and more men,” he jokes. With the presence of architects from all around the globe, architecture in Auroville has evolved since the capsule days. Architects like Gopalan, who are more concerned with materials than forms, have adopted and adapted environmentally-sensitive reinforced earth blocks, ferro-cement, Palmyra wood and bamboo-reinforced concrete in their work. Critics write off Auroville way of lifestyle as too radical for urban application. One should not even try to replicate Auroville because it is rooted in its context, but it is the spirit to explore local solutions for local problems that needs to borrowed. The greatest contribution of Auroville is that it exists. wow!!! its a wonderful concept imbibing sustainable culture among humans without any biasing and conflict....really i m very much impressed with this concept and i will certainly try to develope this type of system in my vicinity...gr8.